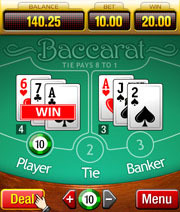 Mobile baccarat or punto banco is a game between the dealer (banker) and the player. It's somewhat similar to blackjack, as you have to hold a higher hand value than the dealer. Baccarat has lately gained a lot of popularity due to variance filled nature of the game. Classic baccarat features a house edge of only 1.06%, which is way less than some of games competitors like roulette. The rules of mobile baccarat are no different than the ones faced at any other gaming environment. A player is dealt two cards and only the last digit of the sum counts. Tens and face cards are worth zero, while aces are worth one point. To give a better example – you are dealt a 6 and 9, whats your hand value? It's 5, as the 9+5=15 and you only count last digit of the value sum. Try again! You are dealt a 6 and a King – what's the point sum of your hand? It's 6 – 10+6=16 and the last digit in 16 is 6 ! It's actually really simple, once you get used to it! A statistical display, shown on the top of your devices screen. It will display your account balance, bet amount and the amount won in a particular round. A ''Deal'' button, which is placed on the left side of the screen. Simply push it to start a new round of game. ''+'' and ''-'' buttons, with a coin denomination in the middle. These are used to adjust your bet-sizing, if you click on the chip, it will automatically change denominations. A menu button on the right side of the screen – this will enable the menu, which can be used for changing specific setting or leaving the table. All Slots Casino – we used it as an example of software for a reason. All Slots Casino is one of the most user friendly and innovative casinos around. Top it off with a clean reputation, great game selection and bonuses! There is no doubt, that you'll be satisfied by choosing this mobile casino. Read the All Slots Mobile Casino Review for more details! 32Red Casino – This MicroGaming's powered mobile casino will certainly satisfy any baccarat player. By choosing a casino with MG's software, you'll always get the best of it! 32Red has also been well received by the players and known industry people. As a special offer for their special device users, 32Red offers $50 completely free! Read our 32Red Mobile Casino Review for more details!